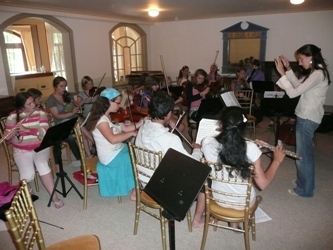 The fourth Musique et Aventure summer music course joined together around 40 local youn g musicians with visiting children from France and the UK. The mornings were spent combining daily one-to-one instrumental lessons alongside chamber music coaching, private practice, and this year also included orchestral groups. Two chamber orchestras were gathered together, the first involved most of the students on the course to rehearse and perform Jason and the Golden Fleece, and the second smaller orchestra performed a small jazz suite. The concert at St Helier Methodist Centre at the end of the course was outstanding, and a real credit to all the hard work that all the students had put in during the week, and in particular the performance of Jason and the Golden Fleece (complete with narration, actors and costumes!) was great fun and superbly performed. The teaching faculty also had the opportunity to perform for all the students, parents, and holidaymakers at Mont Orgueil Castle mid-way through the course. One of the highlights of this concert was violin teacher Eric Wang’s breathtaking performance of Weiniawski’s Morceau de Concert. The Friday evening concert also brought a new dimension to the course, involving Jersey students who are currently studying music at higher education level, including Sam Bisson, piano, Jennah Smart, flute, Georgia Bishop, voice, and Maria Le Brun, piano. In front of a packed concert hall, this concert was a real inspiration for the younger students watching in particular. 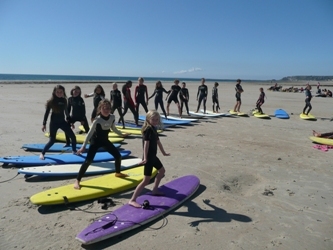 The afternoon activities this year involved surfing at St Ouen’s Bay and Banana and Donut Rides at St. Brelade’s Bay. We were extremely lucky with the weather this year, as both these beach activities were enjoyed in glorious sunshine.